Whoops! A dodgy Qing Dynasty vase. How did that get in the collection? If you spent $88 million to build a world class museum, chances are you'd like to know that at least some of the exhibits on display aren't cack-handed knock-offs of the real deal. Such is not the case in China's Jibaozhai Museum, owned by local Communist party leader Wang Zongquan. Turns out over 40,000 of its exhibits - each costing something like 100 to 2000 yuan, or about $325 tops, according to the Beijing News - are about as kosher as a bacon sandwich. "I'm positive that we do have authentic items in the museum," says museum chief consultant Wei Yingjun, who went on to say that at least 80 items in the collection had been confirmed as authentic. Wei poured scorn on the whistleblower, Ma Boyong, a writer who visited the museum and then told the internet about the travesties on display. "He [acted] like the head of a rebel group during the Cultural Revolution - leading a bunch of Red Guards and making chaos," said Wei. Wondering about the quality of those fakes? 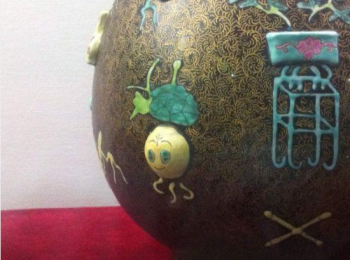 Have a look at this lovely Qing Dynasty vase, and ask yourself whether you'd be fooled by it. "Even the gods cannot tell whether the exhibits are fake or not," said Wang Zonquan, according to the Shanghai Daily. Which would make for an interesting verification process, it must be said; I know I'd start paying attention if, on a placard next to a purported Renoir, God announced that, in His opinion, this was the real deal. It'd probably help the effect if there were scorch marks, as if left by a lightning bolt, next to the display. Jibaozhai's 12 vast halls, stuffed full of cultural wonderworks, are no longer open to the public, as the authorities have insisted on its closure. Jibaozhai has "no qualification to be a museum as its collections are a fake," said a government official. The museum's founders have been accused of squandering village funds by taking cash from land sales to pay for Jibaozhai, and are being investigated. Money laundering charges may be levied.